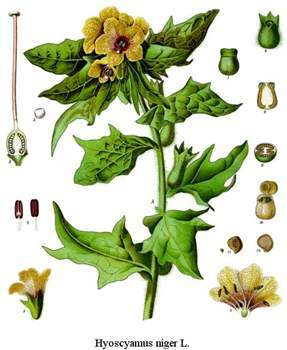 Hyoscyamus niger: image from Koehler's Medicinal-Plants (1887). 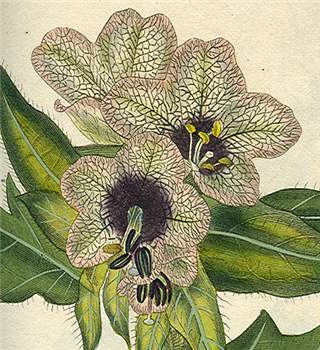 Hyoscyamus niger from Curtis's Botanical Magazine, t. 2394. Hyoscyamus L., Sp. Pl. 1: 179 (1753) & Gen. Pl. 5th edn, 84 (1754); from the Greek hys (a hog) and kyamos (a bean), alluding to the belief that it poisoned swine. Type species: H. niger L.
Annual or perennial herbs, pubescent with glandular or simple, non-glandular hairs. Leaves alternate, simple, entire or toothed or lobed, petiolate or sessile. Inflorescence a dense unilateral spike. Flowers bisexual, slightly zygomorphic, each subtended by a leafy bract. Calyx tubular-campanulate, 5–lobed, enlarging in fruit. Corolla broadly funnel-shaped, yellowish; limb 5–lobed, the lobes folded in bud. Stamens 5, subequal, inserted near base of corolla-tube; anthers bilocular, basifixed, dehiscing by longitudinal slits. Ovary bilocular; stigma capitate. Fruit a capsule, smooth or nearly so, opening by an apical lid, enclosed in enlarged calyx. Seeds reniform to orbicular. A genus of c. 20 species native to Europe and north Africa, and extending eastwards to central Asia. 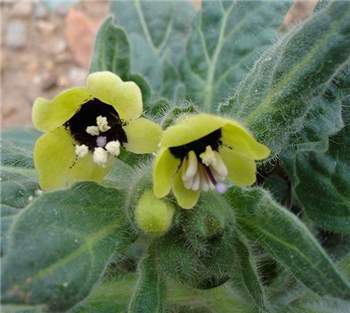 One species, H. niger L., formerly widely cultivated as a source of alkaloids for medicinal drugs. Two species of apparently transitory occurrence in Australia, recorded infrequently as spontaneous weeds of waste places. D.E. Symon, The solanaceous genera, Browallia, Capsicum, Cestrum, Cyphomandra, Hyoscyamus, Lycopersicon, Nierembergia, Physalis, Petunia, Salpichroa and Withania, naturalised in Australia, J. Adelaide Bot. Gard. 3: 133–166(1981).